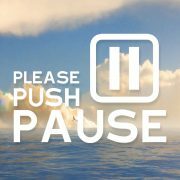 Sometimes we all need to push life’s pause button. I don’t deny the fact that I need a break. But you need one, too! So . . . how about taking one together? Would you consider getting away with me for six days? I’ve put a six-day cruise together for the express purpose of spiritual growth, fun, relaxation, great entertainment, recreation, and amazing food. This six-day cruise through Susie Shellenberger Ministries will happen January 14-21, 2018. We’ll depart from Ft. Lauderdale, Fla. and will visit four ports—three in the Bahamas and one in the Dominican Republic. I’ll be speaking (and I’m bringing another evangelist friend of mine, Billy Huddleston who will also speak, along with some great praise and worship). You’ll be challenged and encouraged spiritually during our times together . . . but you’ll also get to experience all the exciting musical shows that the ship provides. Did I mention all you can eat . . . anytime you want . . . any THING you want? And if you want to stay in your room, no problem. All kinds of fun excursions are available for your enjoyment. But best of all, you’ll get to hear some great messages to challenge you spiritually—and you’ll truly unwind and relax. You’ll come back fired-up and renewed to have a great year in 2018.
and I’m lifting you in prayer. My desire is that you draw intimately close to our Savior . . . and that you truly relax and get renewed! “For all who have entered into God’s rest have rested from their labors, just as God did after creating the world. So let us do our best to enter that rest” (Hebrews 4:9-11 NLT). It doesn’t seem fair that God would send people to hell who have never heard of Him. How can this be? First of all, does the answer to this question change whether or not Christianity is true? If God exists and has revealed Himself to us, and if Christ is the only way to God, then the question may puzzle us, but it won’t change the truth of the Christian message, will it? The Bible teaches us that God is holy, just, unchanging and all-loving. This means that God will always do what’s right—even though our finite minds don’t understand. We CAN trust Him to do what’s right. And “the requirements of the law are written on their hearts” (Romans 2:15). These passages claim that everyone has an inherent knowledge of God, and this can be clearly known from creation and that everyone also has a God-given moral compass. Is it true, then, that “those who have never heard,” really have no idea of God’s existence or of their moral responsibilities? Biblically speaking, it’s not true. “Those who have never heard” have heard something and they do have access to key information about God. They know that God exists, that there’s a moral standard and that they’ve broken this standard. So we know that God desires everyone come to Him through Christ, but not all will. We, however, don’t have access to a list of who will respond to God and who won’t. So early Christianity in the Bible places a huge emphasis on missionary efforts. In other words, Christians are actively spreading the message of Jesus so that “those who have never heard” will get an opportunity to hear. You may have heard or read various missionary stories about those who have never heard the gospel but who have responded to God’s general revelation (through nature . . . through God’s stirrings in their hearts, etc.) and are later visited by Christian missionaries. The Bible records just such a story about the guy named Cornelius. He knew about God, but not about Christ. Because of his sincere desire to know God, Cornelius came in direct contact with the Apostle Peter who told Cornelius about Jesus (see Acts 10 for the entire story). What are these “faulty assumptions”? God is merciful in that He has provided a way of salvation through Christ for those who will accept Him. But God is also just in that unrepentance will not go unnoticed. Let’s remember this: We know that God will deal fairly with those who haven’t received a direct presentation of the gospel, just as He will deal fairly with those who have. But is God’s way too narrow? God’s way is wide enough for everyone willing to accept it and receive Christ. The most important question any of us can answer is the one Jesus asked His own disciples, “But what about you? Who do you say I am?” (Matthew 16:15; Mark 8:29; Luke 9:20). Bottom line: God is just. He is fair. And we can trust Him. We don’t have to understand Him to know that we can trust Him. I’m speaking in Lansing, Mich., this weekend. Will you pray that God moves in a mighty way in our services? http://susieshellenberger.com/wp-content/uploads/2016/04/susielogo-300x93.png 0 0 Susie Shellenberger http://susieshellenberger.com/wp-content/uploads/2016/04/susielogo-300x93.png Susie Shellenberger2017-03-23 14:32:152017-03-23 14:32:15How Come? God wants to reward you. He knows exactly how many good things you’ve done. Think about it: Every good thing you do is seen by your heavenly Father. And He’s hugging you for it. He’s applauding you. He’s affirming and encouraging you because of your good deeds. It’s easy to think no one notices when we go out of our way. or used a fourth tank of gas to help someone run errands. But all these things are extremely important to God. It’s certainly not good works that saves us. We’re saved by His grace. But works are important to God. In fact, we’re told in James 2:14-17 that good works are an essential ingredient to our faith. “Faith by itself, if it does not have works, is dead” (English Standard Version). The apostle James goes on to say, “For as the body apart from the spirit is dead, so also faith apart from works is dead” (2:26). Works alone won’t save us. But pretty soon after we become a Christian, God starts talking to us about getting involved in good works. He wants to use us to help those in and outside of the church. When my dad passed away Feb. 6, I was immensely encouraged by the good works from people in the Body of Christ. Meals, flowers, phone calls, e-mails, cards and thousands of prayers were given in my behalf—and I am STILL being strengthened by those good works. Let’s commit to involving ourselves in good works so that Christ Himself can be glorified. And know that He will reward you eternally for those works. I’m speaking at the Dallas District Ladies retreat this Friday and Saturday—and at the Church of the Nazarene in McKinney, TX on Sunday morning. I’d love to know your prayers are behind me. And we hate it when he messes with us. But guess what—God has given you a weapon to rip satan’s strategies to shreds. We’re told in Ephesians 6:17 that God has gifted us with the sword of the Spirit—which is the Word of God. The sword referred to in this Scripture, comes from the Greek word machaira, and it was a horrific weapon that would inflict fatal damage. It’s tip was constructed upward, and sometimes it was even twisted. So when it was thrust inside an enemy’s stomach his insides were immediately shredded when the sword was twisted. You’ve probably experienced it but didn’t recognize it as such. Maybe you’ve been in a tough situation and God uses His Spirit to suddenly bring a specific Scripture to your mind. That’s rhema. The Word of God is sharp. It quickly defeats satan. That’s why Christ used it as ammunition when He was tempted in the desert. The next time you’re battling satan, make it a point to immediately draw your machaira and trust God to use His Word to defeat your enemy. This is why it’s so important to read the Bible consistently—the Holy Spirit can’t bring to your mind what you haven’t read. Will you allow this to be a loving reminder to read the Word regularly? Even reading one chapter a day will make a huge difference in your life. I’m speaking in Independence, KS this weekend and in Pittsfield, IL next week. Please pray for me. Many of you know that my precious Dad (Elmer B. Shellenberger) passed away a month ago. He was almost 93. I gathered all the kids in the neighborhood and they piled themselves between bicycles, basketballs, hula-hoops and skateboards in our garage while I stood behind my little pint-sized podium teaching them the stories of the Bible. Ha! I have a lot of great memories of my dad (and also my mom who passed away in 2003), and I’m grateful for those. But in the midst of wonderful stories, the path of grief remains. Even though both parents are in heaven, I miss them on earth. Many of you have lost someone through death, and you know first-hand how difficult the path of grief is. I rejoice that we serve a God of extreme comfort. He often comforts me through His Word. 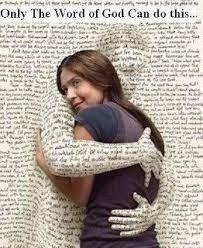 He reaches right through the pages and holds me tightly in His arms. That’s why I’ve attached this illustration today. I want you to visually SEE what we can FEEL when we literally saturate ourselves in His Word. I’m speaking in Fortville, IN this weekend. I’d sure appreciate your prayers.